Now in its tenth edition, the LightCounting Active Optical Cable (AOC) market study has chronicled the beginnings and growth of this market and we see more potential than ever. In fact, for the year 2021, this forecast is about 33% higher in unit shipments than our year-ago forecast. But due to ever-increasing price pressure from the mega datacenter market, our revenue forecast for 2021 has barely risen. Some major datacenter builders, especially in China, have found advantages in using single-channel AOCs for connecting servers to first tier switches. This has added very substantial unit volumes. While High Performance Computing (HPC) has been soft this year, it is poised for new growth. The fastest machines in the Top 500 list of supercomputers will be turning over with exciting new machines on the horizon. For going on two decades, the embedded optical module (EOM) market has provided high-speed, intra-system proprietary links inside custom supercomputers, telecom equipment and the largest core routers. Two new major programs improved revenues in 2015-2016 but as always, this market has remained lumpy and very sensitive to large orders. A couple large opportunities fizzled, while new opportunities have now emerged. We now project the 2021 EOM market to be about 6% smaller in unit shipments but 11% greater in revenue than our forecast of a year ago. We see annual growth rates increasing strongly by 2019. First we must look at a very important recent trend in HPC and in hyperscale data centers: machine learning, the latest buzz phrase [along with AI and deep learning]. Deep neural networks are needed for better image recognition, among other things. There is so much additional content to categorize; it cannot happen with current technology. A cat video posted to the web would then be searchable as a cat video, based on what is recognized in the video itself. Machine learning is about tightly coupled racks of hardware. Between racks, coupling is loose, at least for now. Machine learning places heavy demands on interconnects to the processors and to memory. It will create a push for higher performance and more advanced technology rather than just cost. It will change the physical architectures from just stacked servers with leaf and spine switches to entirely new fabrics. Things are splintering over frustration with PCIe to serve the cloud and HPC. Today’s memory bandwidth cannot feed all the processor cores. “Rack disaggregation” has been a buzz phrase for several years, but we are now seeing how this will happen. 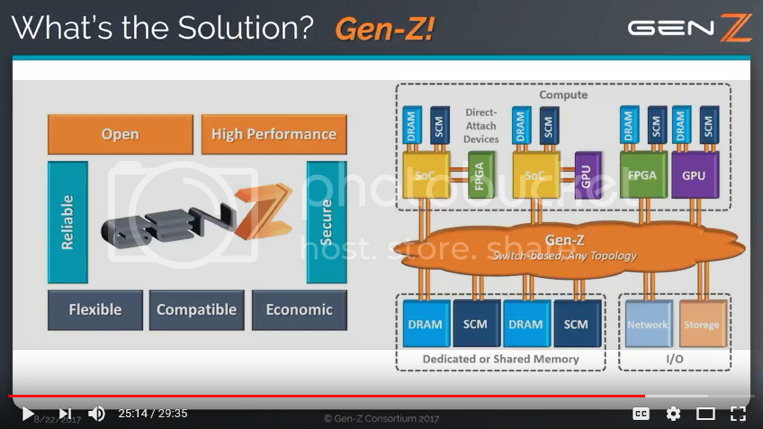 One good example is a Gen-Z, a memory-centric switched fabric architecture defined by a consortium. Gen-Z is all about making new “storage class memory” available to each CPU in the system. It is shared DRAM and MRAM where each processor sees a large pool of memory as a continuation of its own local memory. Gen-Z today runs at 25Gtransfers/s. It will move to 56G and 112G in the future. Optical interconnects will come into play at 56G. LightCounting’s AOC/EOM report and forecast is an update of the December, 2016, report of the same name. Written by Principal Analyst, Dale Murray, this report gives LightCounting’s outlook on optical interconnects that include active optical cables and embedded optical modules. The report explores recent and future applications in high-performance computing, cloud data centers, core routers, telecom equipment and military/aerospace markets. Historical shipments are explained for 20 product categories. A detailed Excel spreadsheet accompanies the report, providing a five-year forecast of shipments, prices and revenues broken down by product types, speeds and by application.